This was a golden find for me. This picture was taken at the New York Museum of Modern Art in 2009. 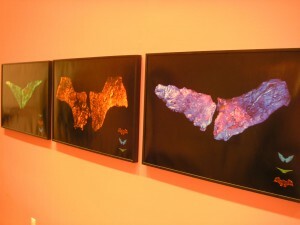 These are blown up photographs of pig cells that have been artificially cultured and grown round a scaffold to form wings structures, hence real Pigs Wings! This is part of The Tissue Culture and Arts Project by a mixed team at SymbioticA based at The University of Western Australia. This organisation does everything that summarises the fine crossover of arts and science with a purpose, this maybe a little bias as I work on cell culture systems and often sit there thinking about its ethics, the best known issues of ownership highlighted in HeLa cells. They often exemplify the challenges and ethics involved in the cutting edge of biomedical research, and pull them out in an angle for true public consolation. In this case they have named each version after dinosaurs, using a thread in public conscious of bringing mythical creatures back from the dead using genetics for better or worse.